Effective and comfortable displacement ventilation — Mike Gosling. Displacement ventilation can be particularly effective in large open spaces, such as theatres, sports venues and airport concourses. To ensure that the displacement ventilation system delivers to its full potential, however, essential best-practice approaches need to be adopted to accommodate the specific airflow characteristics of this technology. 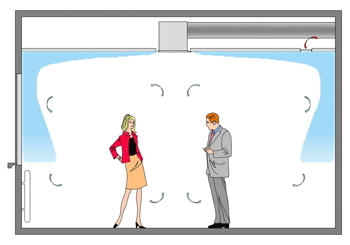 Whilst conventional mixed-air distribution systems deliver hot or cold supply air at relatively high velocity from ceiling-mounted diffusers (Fig. 1), displacement (fully-stratified) air distribution systems operate by delivering cool air at reduced velocity from low-level, sidewall diffusers (Fig. 2). Fig. 1: A conventional mixed-air distribution system delivers supply air through ceiling diffusers. 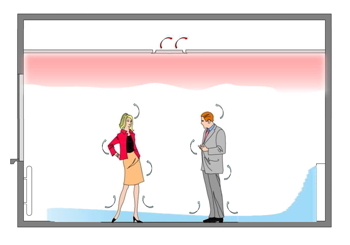 The supply air delivered by displacement ventilation is always cooler than the room air, so it quickly drops to the floor and moves slowly across the room. When this slow-moving air mass encounters a heat load, it rises and carries the heat towards the ceiling. A layer of warm air forms above the occupied zone due to natural buoyancy. Internal heat loads and contaminants are carried away by the extract air system. This form of ventilation provides a number of benefits — particularly for applications such as shops, factories, cinemas/theatres, auditoria, sports halls, fitness rooms, restaurants, conference rooms, airport concourses and atria. Firstly, the upward migration of pollutants effectively increases concentrations in the unoccupied upper zone while reducing concentrations in the breathing zone, improving removal of airborne contaminants. Secondly, the supply of cooled air at low velocity reduces energy consumption, in comparison with high-velocity air supply. In addition, the increased effectiveness of air distribution can reduce the requirement for ventilation air, as internal heat-load concentrations help to draw the air across the room. Noise levels are reduced due to the supply of air at low velocity, and supplying air at 19°C opens up the possibility of using fresh air ‘free cooling’ for large parts of the year via free-cooling chillers. The airflow characteristics of displacement ventilation, however, require consideration when designing systems. Fig. 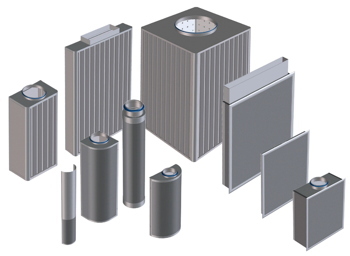 2: Displacement air-distribution systems deliver cool air at low velocity from low-level diffusers. Displacement-ventilation diffusers are ideal for installation in aisles and corridors or in spaces such as atria or airport terminals, where occupants typically move through the zone (transient). This air-movement strategy involves supplying cool air directly into the occupied zone, which cascades from a sidewall diffuser and travels across the floor. So it is important to consider the comfort of sedentary occupants. Although air is supplied with low velocity, it can accelerate as it falls towards the floor when it leaves the diffuser, due to gravity. The air moves along the floor in a stratified flow with a relatively constant depth (typically 200 mm) with maximum velocity in the stratified flow around 10% of this depth (about 20 mm from the floor). An occupant sitting at a desk situated in the ‘non-comfort’ zone adjacent to the displacement ventilation diffuser, for example, could therefore sense cool air at ankle level. As a result, furniture layout and zone occupation need to be determined before the unit type is selected. As displacement ventilation requires the supply air to be cooler than the room air, with very rare exceptions, this approach is only suitable for cooling with a supply temperature range of -4 to -6K. Displacement ventilation is typically recommended for cooling loads less than 60 W/m² for comfort; however, individual applications must be investigated to ensure comfort is achieved. Therefore, before selection, ensure the project requirements are within achievable limits. Air delivered by displacement ventilation diffusers is always cooler than the room air, so it quickly drops to the floor and moves slowly across the room. The height of the room is an important factor in displacement ventilation design, as considerable mixing can occur below the ceiling, due to the interaction between upward and downward moving buoyant air flows. Buoyancy-driven ventilation is therefore less effective where ceiling heights are low, for example less than 2.5 m.
Displacement diffusers can typically provide coverage into a room that is up to six times the length of the ‘non-comfort’ zone (this is any area in the occupied zone where local air velocities exceed 0.2 m/s at a height 200 mm above the floor). We recommend a maximum of 6 m for comfort and 8 to 10 m for industrial applications. Large rooms can be supplied from the side walls so long as the distance from the diffuser face to the furthest projection is no more than 10 m.
When room dimensions exceed 10 m in length or width, it is best to place displacement diffusers on more than one wall. By placing diffusers on opposing walls, rooms up to 20 m can be supplied from side walls. Another solution for large rooms is to place 360° diffusers throughout the interior space. Mike Gosling is product technical manager for grilles, diffusers and louvres at Trox UK. Detailed guidance for displacement ventilation systems is provided in Trox technical leaflet L-08-1-04e. Alternatively, download Trox’s easy product finder free from the link below.